I made this bowl for lunch today as I was pressed for time but still wanted a high quality meal. One pack of natto was in the fridge, as well as fresh seaweed. These provided the inspiration for the final result. 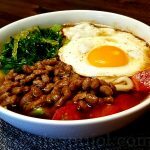 This natto recipe includes some of the most nutritious ingredients available, combining the vegetarian unsaturated fats and nutrients from the avocado, tomato, seaweed, butter and olive oil, as well as the complete proteins from the soy-based natto beans, plus the egg fried on medium to low heat. 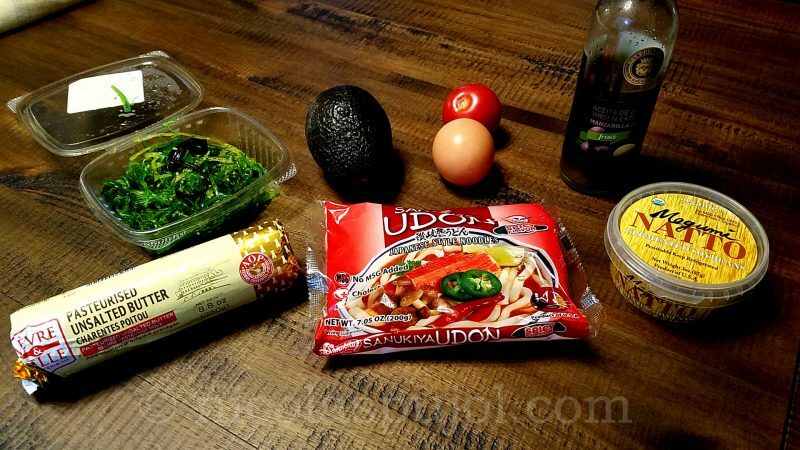 Japanese udon noodles complement the macro nutrients with a supply of carbohydrates. Now, for the bonus: the dish tasted delicious! This recipe takes about 20 minutes from start to finish, so long as you can multi-task while noodles are cooking. During this time you can fry the egg, cut the vegetables and place them in the bowl while waiting for them to be done. 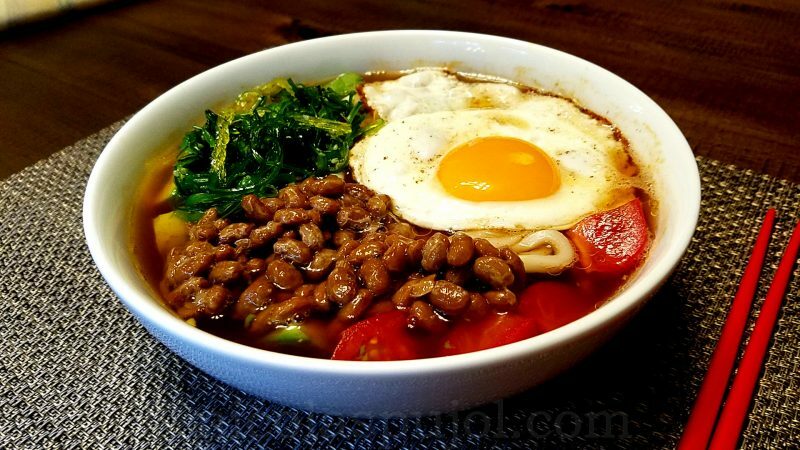 As I think about natto, this ingredient is so nimble, once one has acquired the taste for it. You can make an endless variety of dishes with it. It’s similar, in a way, to eggs. You can put them in salads, in main dishes, they provide flavor and top quality proteins, although they are not vegan like natto is. Since this dish does include a fried egg, it’s neither vegan nor vegetarian. 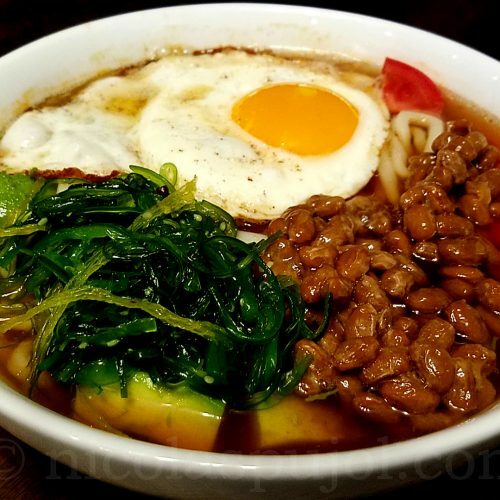 Look for my other natto recipes for a vegan alternative. 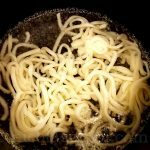 Bring the water to a boil using a medium sized pan, then add the noodles and cook them for the required time indicated on the package. Melt the butter in a small frying pan and add the egg. 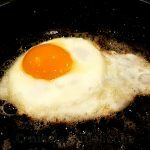 Start at medium heat and fry for 3 minutes then lower to simmer and cover the pan to finish the cooking so that the egg white is fully cooked but neither the egg nor the butter is burnt. 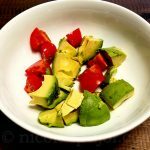 In the meantime, chop the tomato, avocado, and place them in a bowl. Add the spices to the noodles, stir and add the mix into the bowl. 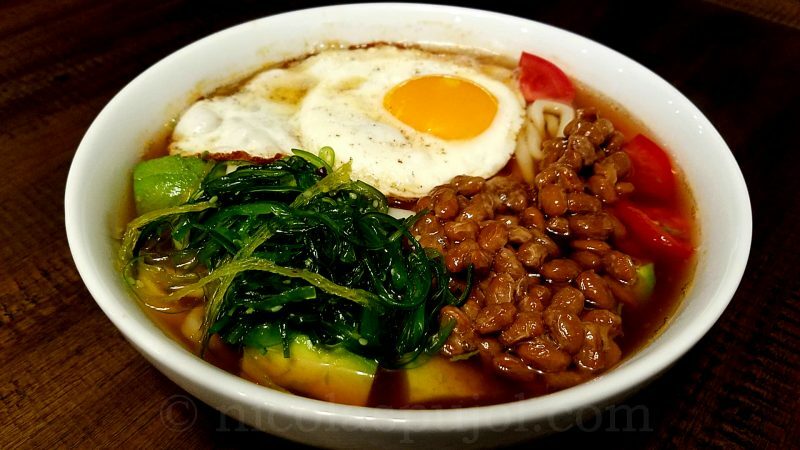 Top with natto, egg, and seaweed. Optionally, sprinkle a bit of olive oil and/or hot sauce for added flavor. For the spices I used the noodle spiced that are typically included with the package. If you do not have spices you can can blend a bit of miso paste and low-sodium soy sauce, and add some hot sauce to taste.